Bows That Make A Statement... and an Impact! Confession: I like big bows. I LOVE big bows! Both of my girls have rocked big bows everywhere from sporting events, to pre-school, park play dates and even this NICU. Some say you are never fully dressed without a smile, but for our family - you are never fully dressed without that big bow! While Grant was gone last weekend and we were stuck at home potty training Grace, I had that entrepreneurial itch after someone asked for the 10,000th time where I get their bows... why not sell them myself?! So it has been a busy past 6 days sorting gorgeous beautiful bows, figuring out packaging, building our website, starting on branding, etc -- and we are still just a work in progress... but we have a site! You can read more about the inspiration at "More than a Bow" but when I was reflecting on our NICU journey that began a year ago with me in the hospital, and 10 months ago with Emerson Claire's birth - I remembered the first time I saw Emery dressed in clothes with a big bow on her hat that the nurses had tucked her in ("tucked", as even the preemie sizes were way too large) - she was my doll, and in that moment, she was so so real. Such a little fighter! As anyone who followed our journey knows, the 63 days of our NICU journey were rough, and the days I could just order Munchery for dinner or have Google Express drop of diapers made everything exponentially easier. We were fortunate, but all of these little "helps" are expensive -- as was our million dollar hospital stay! We want to take the silly logistical lift off NICU families, and hope that proceeds from our bow sales can make an impact. It may not be much, but to NICU families, a hot meal to share together when you feel numb means EVERYTHING! Head on over to http://www.shopkatertots.com to check out our limited collection! We have all sorts of fun (including some Mommy & Me gear I am super excited about) planned for later this Fall! Big Day: Paid off (hopefully) Emery's last $900 of doctors bills!!! Even with our amazing insurance, we have spent about $18k out of pocket. The biggest reason, is our insurance only covered visits from some doctors, not all - but when your child is put in the NICU, you have no choice which neonatologist is on-call that day and obviously we were not going to ask that our daughter not be seen for days at a time until someone in our network was available. It is a tough call, one that I have spent hours upon end negotiating with the hospital and insurance - and, fortunately, had pretty great resolution. While we have tucked away HSA from Grant's paycheck, HealthScope actually makes us pay everything out of pocket and we get reimbursed at the end of the year- which is frustrating. That said, hopefully we are now on the other side of things, looking forward to saving again! Three months ago to the day, I walked in to a routine MFM appointment and was immediately put on bedrest at just 24 weeks- instantly my whole life changed. The trip scheduled for the next day to Palm Springs cancelled, my daughter and husband moved in with my parents and I spent a month flat on my back in a lonely hospital room praying my sweet girl would keep cooking. After a month of bedrest I was discharged but within days I ended up back in the hospital and in labor. Due February 1, 2016, giving birth on November 15, 2015 came as a huge surprise- and the past few months have been peppered with long days and tough nights by her side at the NICU and balancing logistics of soending time with Grace and figuring out childcare. Until a reader mentioned it, I never realized that I hadn't shared why we named her Emerson... Emerson means "Brave" and when she came too soon, we didn't have a name picked out yet but in the labor room ran Emerson/Emme by her grandparents and all agreed on it. 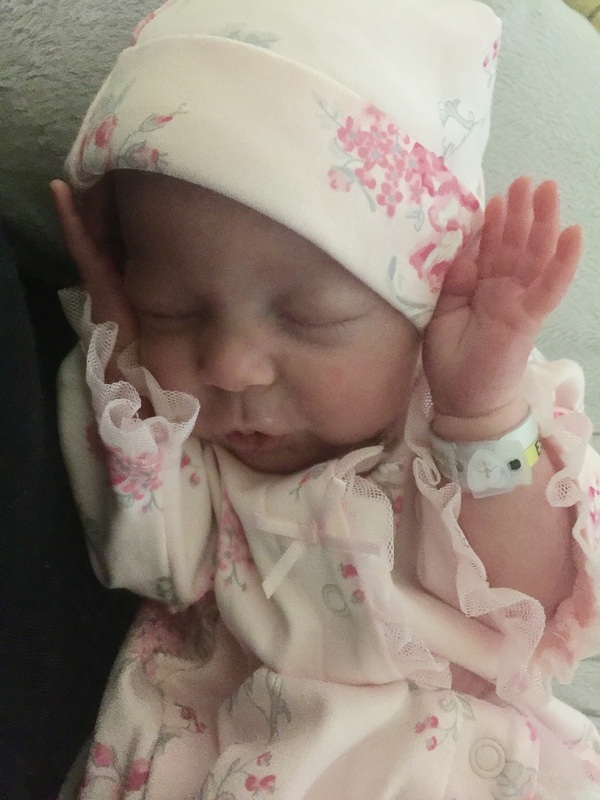 But it wasn't until the first time I saw her little body fighting so hard to stay with us that I knew there was very little I could do but giving her this name was my way of instilling the little bit of bravery into her life that I could... I knew she would need it... We both would. Again we have been told tomorrow is the day we get to bring her home (we had a poll, and if she does come my mom wins!) This time, I am not nervous- only excited. I am ready. Emme has doubled her birth weight and looks strong- her feedings are going really well and she hasn't had an episode since the early hours on 1/12. God willing, tomorrow I will have my family together - the ultimate pay off for all of those tough days on bedrest and in the NICU. While Grace and Emme did meet on Christmas Eve, they haven't seen each other since aside from Facetime. We are SO close... And recognize we wouldn't have made it this far without the continued support of our friends, exceptional care by our nurses and the power of prayer. Thank you! The excitement mixed with anxiety that new moms feel as the final weeks of their pregnancy roll around is a unique feeling - with butterflies in your stomach and worry on your shoulders. Although Emme was born two months ago, those same feelings have been flooding my every day this past week as we are on the eve of bringing home sweet Emerson Claire and soon instead of mothering one of my babies at a time, I will finally be a mother of two mothering two under two in our very own house. I am terrified... but thrilled. After the false hope of having Emme come home on the New Year, and again on Tuesday, I wasn't holding my breath when we were told she would be coming home today - but this time I have to admit it felt different. We did the carseat test again, and she passed. She had the RSV Synergis vaccine, Hep B, and I even sat with her as she did a comprehensive discharge physical. She is weighing six whole pounds now! Grant's mom is in town helping with Grace and my parents are back from the funeral just in time - pieces were falling into place. When Grant and I left the hospital last night around 9:30, we were smiling from ear to ear - it was really happening - we were ready. It reminded me of when Grace started coming but I had delayed labor and it took a week for her to finally enter the world. My girls run on their own timeline, that sure is evident already. Then at 11:30pm last night, I was awoken by a call from Dr. Chan that Emerson had suffered another serious spell and hadn't been breathing, requiring stim to rescusitate. She was kind in noting our disappointment, with dreams of bringing her home today shattered. As much as I as longing for this to be the day, Grant and I are both confident in the decision to stay. When she is finally discharged, one thing I have always found to be hilarious is that I have to exit the hospital in a wheel chair- like all of those moms I have longed to be outside the hospital being discharged with their cute new bundle of joy tucked safely in a carseat as the nervous new daddy fumbles as he pulls up the car. I know it may sound really weird, but I cannot wait. Yes, Emme was born in November, but I plan on reveling in her homecoming! (I've already recruited my awesome mom to get pink balloons and cheesy "Its a girl!" signs to welcome us home, whatever day that is.) I have no idea why the silly little celebration has come to mean so much, but I am looking forward to the cheese -- the celebration -- the sigh of relief. I am writing this outside the NICU awaiting to hear if the doctors plan on putting her on a 2 day or 5 day study, but in reality - we are happy to do whatever is best. As I mentioned above - Grant and I were both awoken by the call - meaning had she had the spell at home and we were both asleep - who knows what would have happened if she stopped breathing and we had no monitors. 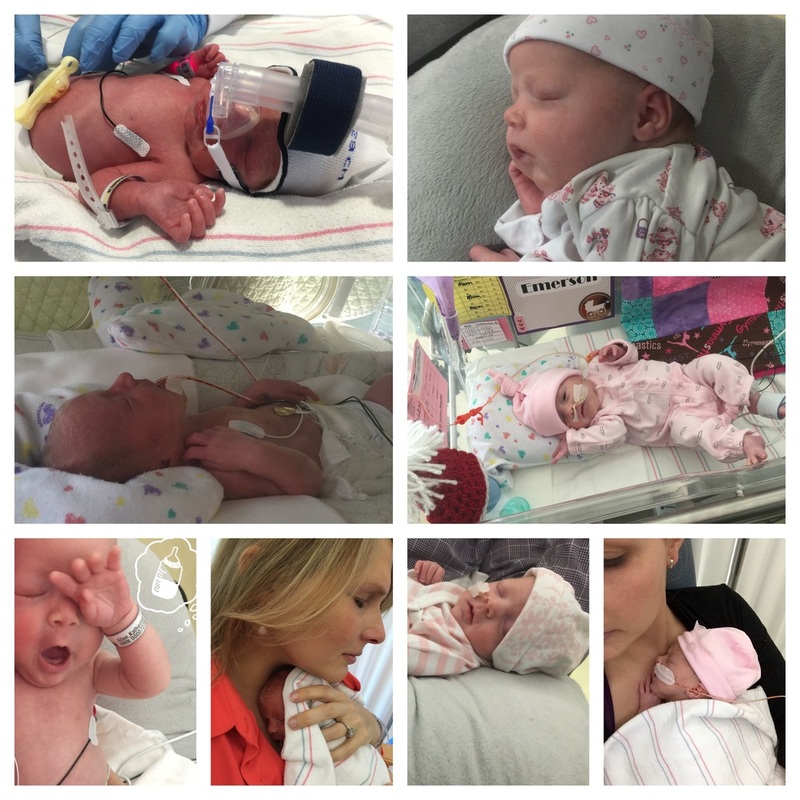 I am grateful for the amazing team who has helped Emme thrive and know that while we have 54 days in the NICU down, a few more will only help her grow stronger. Heck - she wasn't even supposed to be born until February 1st... look at all that she has accomplished since November 15th! This morning when the alarm went off at 3:45am, for the first time in my life I was tempted to try out that snooze functionality. Normally chipper in the morning, the late night feedings at the hospital compounded with the early morning feeds just has me running on exhausted. I walked Kellydog which usually brings me joy getting some steps for my FitBit, but I was impatient hoping she could get her business taken care of so I could just get to the hospital and "get it over with" so I could get home and maybe get back to bed. My attitude wast terrible, talk about waking up on the wrong side of the bed! But this morning she was in the same place, yet things were different... because I got to see my beautiful baby girls face in its entirety for the first time ever- no tubes! You may remember when she was born, I was heartbroken that she was immediately whisked away to the NICU and put on a CPAP machine, and since has remained on a feeding tube taped across her face inserted through her nose. She has officially graduated from the feeding tube/gavage and is now taking all 8 of her feedings by mouth (breast/bottle) and even gained 46 grams yesterday! I knew she was perfect before, but this morning with her face smiling at me with no tape or tubes, it was miraculous. God is good! i marveled at each milimeter of perfection. That bad day is now far far away and I cannot wait to get back to the NICU and see those scrumptious cheeks! It has been 43 days in the NICU and she is still living in her isolette connected with a bunch of wires- crazy to think she should still be inside of me for one more month, but I am confident we are winding down our stay and on the dawn of the next chapter: when we finally get to bring sweet Emme home and have our family together under one roof. Without the prayers and support of all of our friends and family, I am not sure we would have made it this far, or had the energy to keep going - thank you for your contagious faith. Savor this time with your family and friends this holiday season! No tape, no tube- just two scrumptious cheeks to kiss and pinch!! When it is baby's first Christmas, parents all around exclaim that their "Christmas Gift Came Early This Year" (baby's birth) and in so many ways, that is true. But for me, my heart just wouldn't be whole until I had our whole family of four together for the first time, and yesterday all of my dreams and wishes came true with Grace visiting Emme in the NICU for the very first time. The NICU is a terrifying place, and Grace did so well - it helped being so warmly welcomed by all of the nurses. As she had to have her temperature taken to enter, it was a rough start- but even in just the short visit she seemed mesmerized by her sister's tiny fingers. Emme is doing well, but not great. For the past few weeks our doctors had been hinting she may go home "this year" but as she is still in an isolette to regulate temperature and hasn't yet graduated from her feeding tube, we have a few more weeks. 45 days old and she has already progressed and learned so much, she is a champ at both breast and bottle feeding, but is still tiring out regularly- though we are proud to announce this little girl has made it to the 5lb club! Her Vitamin D levels are extremely low, which in studies has shown preemies suffer from a variety of ailments from MS to Lung Disease later in life. The biggest concern today is her hemacrit levels dipping- lending to serious bouts of anemia causing her to be pale and stop breathing - her ABD episodes have increased over the past 48 hours so she is being monitored closely with the likelihood of a transfusion increasing. All that said, these are typical issues and while I would love to have her home spending Christmas with us, I have ever confidence she is where she needs to be- with the amazing NICU staff who work tirelessly no matter the day. all of of our warmest wishes and hugs to you and your family this Christmas! Just about every NICU parent who has been brave enough to show their support and share their own journey, warned us there will be days when you take two steps forward, then one step back. In reality, I should have been prepared... But we were doing soooooo well. Each day Dr A would say what a rockstar our daughter was, constantly improving and hinting that we could be taking our daughter home around the new year (4weeks ahead of schedule!) - she even mentioned maybe, just maybe this year. This really isn't a big issue - she is just failing to maintain her temperature- and as a 34 weeker, it is to be expected. But the nurses all seemed disappointed and hinting that maybe she just isn't doing as well as we had all been celebrating. I mean, she is supposed to be cooking for another 6 weeks! I think this is just weighing heavily on my shoulders as I had gotten too confident. We had our routine. She was constantly improving with feeds. I had noticed the past 48 hours out of her isolette I rarely got a temp above 36.5, but I figured she was just adjusting. Last night Grace, Grant and I got together at a friend's home down the street for a holiday party and enjoyed ourselves - escaping the bright lights of the NICU and constant beeps of monitors for an hour- is this our punishment for embracing the holiday spirit? Should I have been there doing skin-to-skin? Seeing her regress is the ultimate mom guilt. I don't know if I feel guiltiest about not being there when she was moved back, or the fact that I haven't even procured or set up a Christmas tree for Grace or really gotten any presents yet. I'm split in two and right now it feels like whatever I try I'm letting someone down, failing to live up to duty as a role model for my little munchkins. And I am exhausted. So exhausted. But tomorrow is a new day- filled with another ROP eye exam and nutritional blood labs for the little one, as well as monitoring her progress on the HMF... Tomorrow is another day for progress-- and I acknowledge I should never be complaining about bad days, as we are extremely lucky to have the days to share with our sweet Emme who came too soon- whether they are good or bad. Really looking forward to the holidays passing and 2016 coming so that we can start fresh and find out feet with our whole family home and under one roof. hope you and yours are enjoying the holidays! Spread a little Christmas cheer for us!